We decided to send our bikes over the Darian via airfreight and ourselves via commercial airliner. It seemed safer. 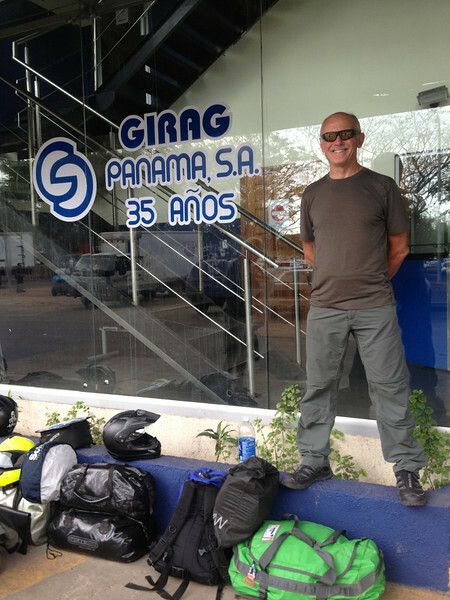 The airfreight company, Girag, said to be there before 4:00 to drop off the bikes. So we bought 6 airline tickets on COPA airlines for a flight that departed at 6:30 PM. Since we didn’t want to miss our flight we decided to leave early for Girag and arrived at their front door at noon, a full four hours early. Here we are at the front door ready to get the process started. Of course it was lunch time so we hung around and waited in the hot and humid 95 degree heat of the parking lot. Around 1:00 someone came out to help us, first we had to unload the bikes. And start filling out paperwork. And wait. 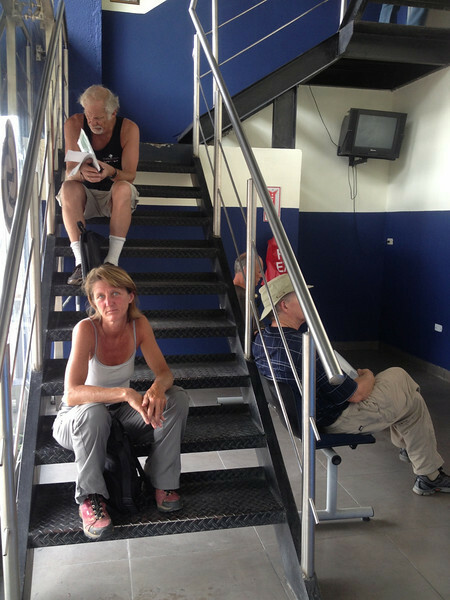 There was a small waiting area that was sort of air conditioned but it was better than waiting outside. We posted a “guard” outside in the heat to keep an eye on things. Michael cheerfully took the first shift. As the day wore on, guard duty in the heat became more of a chore. Dave wasn’t as enthused. As the hours wore on our boredom was punctuated with occasional spurts of more paperwork At one point we rode the bikes 50 feet to a gated area where more paperwork was completed. We had a visitor who liked to stay cool in the shadow of the bikes. 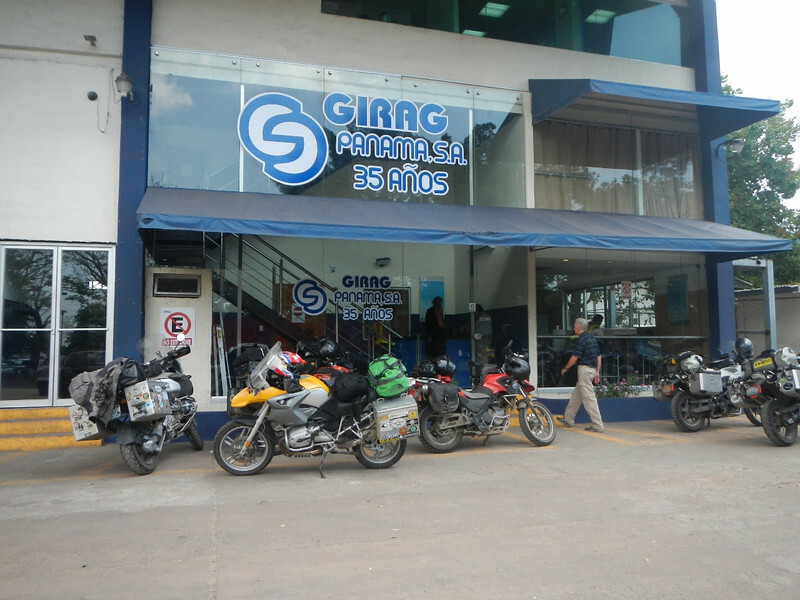 Finally, after not what seemed like hours, but actual hours later, we had the Girag paperwork complete and only needed to run papers to the Aduana (customs) office for a final set of copies, stamps and staples. We’ve come to learn that when the stamps come out and papers are getting stamped with three, four and five stamps each that we are nearly ready to be done. At 4:30 we were all back at Girag with the paperwork completed and just needed cabs for us and our gear to take us to the other side of the airport. Suddenly all the cabs were gone! Really! There had literally been dozens all day driving past the Girag office and now there were none. 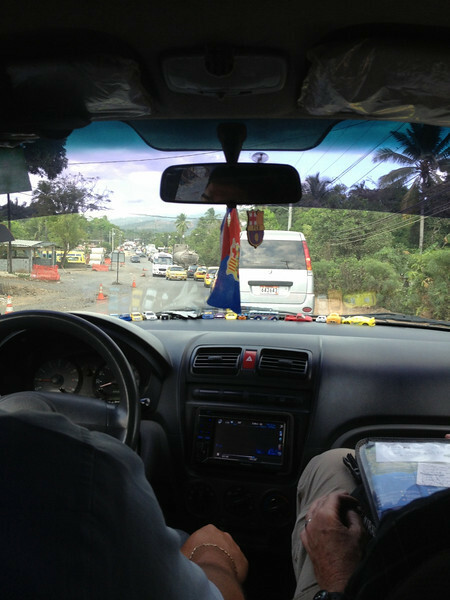 We sent our scouting missions to the main gate to try to flag down three cabs. It took over a half hour to round up the cabs and it was now 5:00, still time to catch a 6:30 international flight, right? Traffic was hell. Due to construction it took us close to a half hour to get six of us and all our luggage to the check in counter. When I got my boarding pass the woman told me “the plane is boarding now”. Great. Somehow we all made it through security and immigration just in time to board the plane. Whew! Dave had a van arranged to pick us up in Bogota and we eventually (story left out here) found ourselves checked in to Charlie’s Place Hotel. With no food since breakfast, Deby and I went directly to the hotel bar in hope for some beer and bar food. Yes on the beer and no on the food. No worries, we ordered two “Poker” beers and settled into a chat with the bartender. When I told the bartender about our trip he was pretty amazed that six gringos would be daring enough to ride motorcycles all this way. 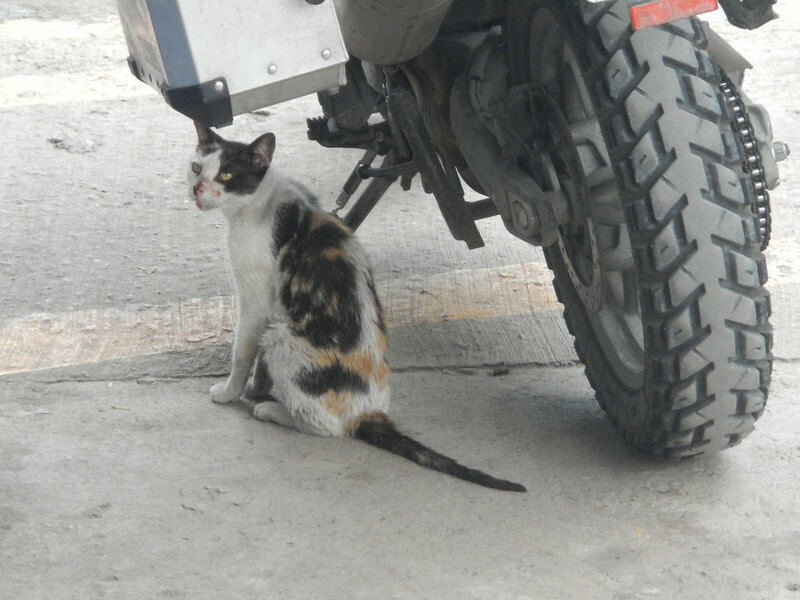 He was especially concerned that we rode through Mexico…. “wasn’t that dangerous”? he asked. We both laughed because when we were in Mexico everyone wondered if it would be dangerous in Colombia. People in the United States just assume everywhere is dangerous. 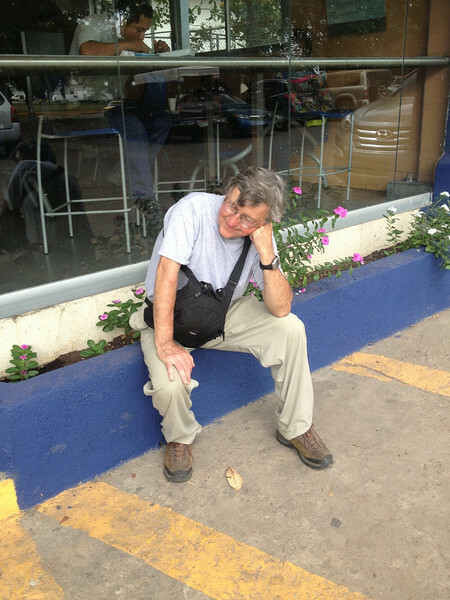 More on Bogota in the next post……. 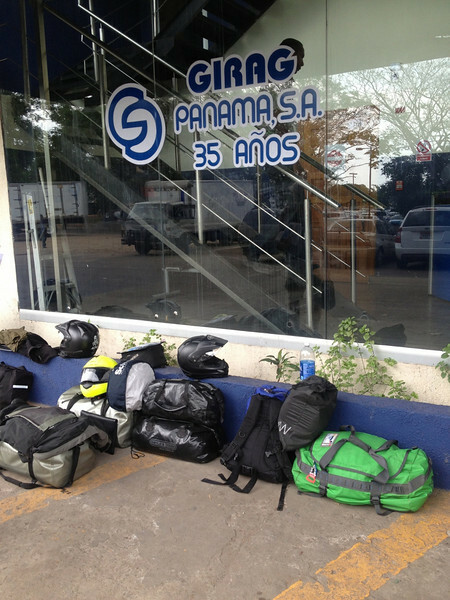 This entry was posted in 2013 Colombia, 2013 Motoraid II, 2013 Panama, Motorcycle Adventure by donnh. Bookmark the permalink. 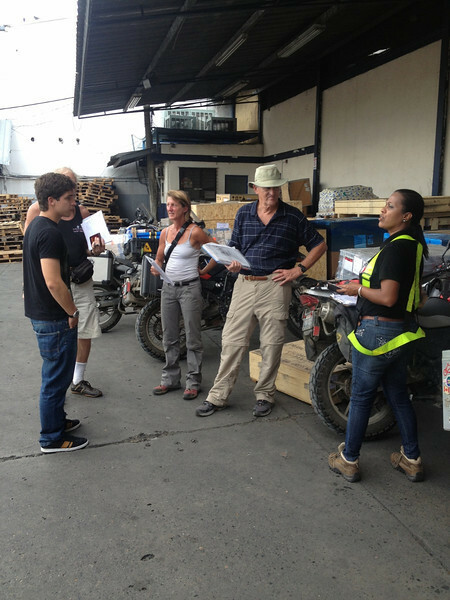 Fascinating to read about the Darien Gap…..thanks for all the info. You know, there’s still time to backtrack and explore!!?? Thanks for the wonderful blog(s)!! Geesh, thanks for the correction. Must be getting tired, fixed. Wow. just wow! you guys are really in Colombia??? wow. The process at Girag is soooooo Panama. Hurry up and wait. And they just love to show how powerful they are by witholding the chop, the stamp you need. I always wonder if they’re waiting for a couple of bucks. So much unnecessary red tape….